The Edmonton Prospects announced Jordan Blundell as their new Head Coach and Director of Baseball Operations at a press conference at RE/MAX Field Monday morning, replacing former bench boss Ray Brown and DOBO Orv Franchuk after the two resigned earlier this off-season. Blundell takes over a Prospects franchise that has experience playoff success over the past number of years. 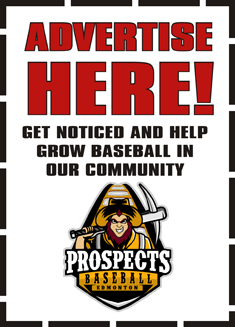 Last season, the Prospects fell in five games to Medicine Hat, preventing the organization from reaching their third straight WMBL Finals. Under the direction of Brown and Franchuk, the Prospects have established themselves as one of the WCBL’s premier franchises. A large portion of Blundell’s job will be not only to develop the organization for future success but build on the strong foundation set by his predecessors. A major reason for Blundell’s hiring is his exceptional track record both coaching and recruiting in the Edmonton area. In 2008, Blundell was named the WMBL Coach of the Year with the Sherwood Park Dukes. He’s additionally been the Head Coach of the 2010 CCBC Championship winning VIU Mariners and was named CCBC Coach of the Year. His track record with recruiting also speaks for itself, as he recruited both the 2008 and 2009 WMBL – now WCBL – MVP’s. Finalized Cassidy, “He’s got a great coaching resume when it comes to being able to lead men on the field and make decisions, but just as important he has a great recruitment strategy with the right connections”. The team also confirmed their annual Prospects Gala will be held on February 16, 2019, with Buck Martinez, John Short and Kent Morrison confirmed as attendees for this year’s function. Final Game Of The Season!